Welcome! At St Mary’s Catholic Primary School we are committed to providing the very best Catholic education to equip our students to live and work confidently, effectively and wisely in a complex and ever changing world. In fulfilling this commitment, we will constantly strive to be a school that values excellence and provides avenues for students from a wide range of abilities and interests so that all students have the opportunity to experience success in their life at school. We encourage in each student a desire to achieve in all areas of school life - spiritual, academic, creative, physical and emotional. Through our commitment, opportunities are provided for students to develop self-esteem, leadership and a sense of social and environmental responsibility. 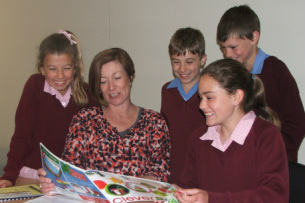 St Mary’s Catholic Primary School's goal is to be a school that encourages mutual respect, partnership, healthy relationships and appreciation of all members of the community.